We are looking at a coastal flood around New York City region tonight that is nearly certain to be record-breaking. The morning flood at The Battery and other nearby locations was close to the flood elevation of Irene, and only about a foot lower than the record-setting flood there of Hurricane Donna (1960). We may even best the highest flood elevations in NYC history, which occurred in 1821. This morning’s flood elevations are a useful preview of what will occur this evening as Sandy’s worst comes our way — expect roughly 2-7 ft higher flood elevations, and find high enough ground to be safe from the higher end of that, just in case! 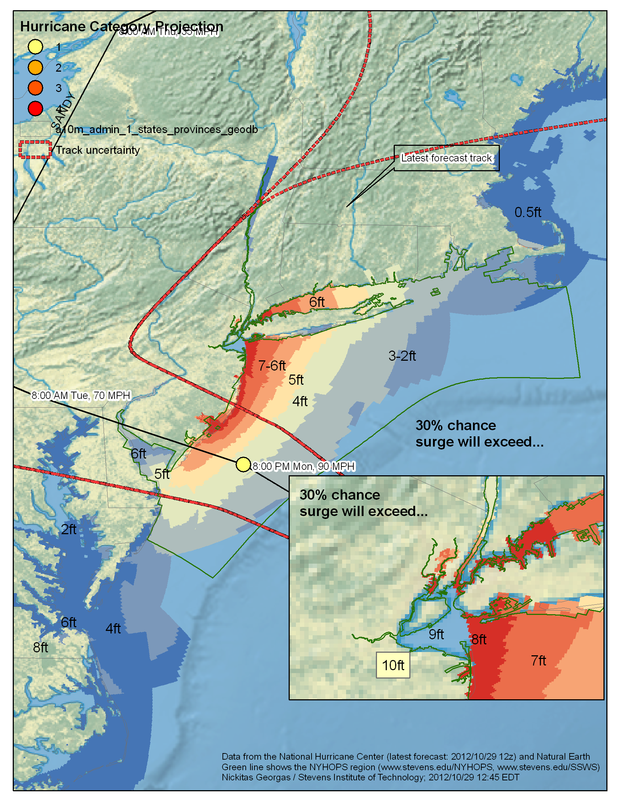 NHC forecast track for Hurricane Irene, including the storm surge heights that have a 30% likelihood of being exceeded (data from NOAA’s National Hurricane Center’s P-SURGE). Courtesy of Dr. Nickitas Georgas. I am basing this on the range of expected storm surge, 6-11 ft, as well as the fact that the flood is likely to come near high tide at 8:48 pm, which adds 2.4 feet more (relative to mean sea level, MSL, similar to NAVD88). This total water elevation (storm tide) is 8.4-13.4 ft above MSL whereas 7.4ft above MSL is the record elevation from 1960’s Donna. That is, this flood is likely to beat the Battery record by 1 to 6 ft! And the estimates of the 1821 flood elevation are roughly 11 ft above MSL, so we may even best that approximate level that is thought to be the highest in all ~400 years of New York City (and New Amsterdam) history. This is no celebrating matter, as this puts seawater roughly 2.5 to 7.5 ft above the city’s lower seawalls and deep water may quickly come into the city’s lower neighborhoods. Make no mistake — this isn’t just a concern for Evacuation Zone A, it could be a danger to people at low elevations in all the Evacuation Zones. People in basement apartments or on the first floor should be ready and watching out this evening for floodwaters, and have a plan for quickly getting to a higher floor if they aren’t already “evacuating” to a friend’s apartment. This entry was posted in water, weather and tagged datum, evacuation, forecast, Frankenstorm, gale, hurricane, long island, Long Island Sound, MSL, new jersey, New York City, Newark, predicted, Sandy, sea level, seawall, storm surge, storm tide, tide, water elevation, wind. Bookmark the permalink.